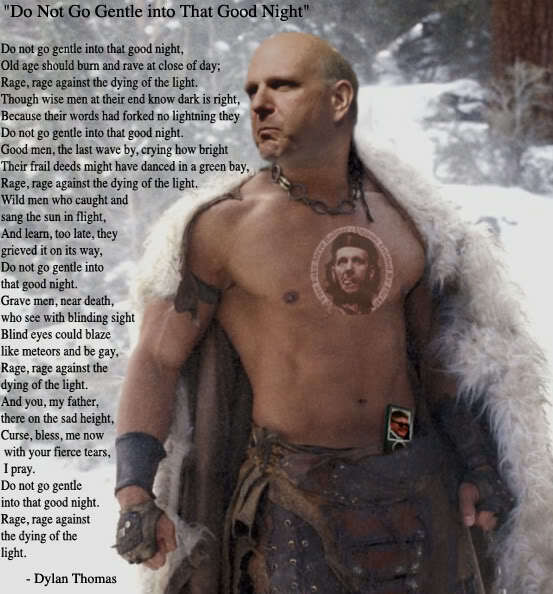 Wow Mr. Ballmer, all that monkey dancing has you buffed and ripped. I am impressed, also I'm ashamed I doubted you. Now I know what happens to all those disgusting fatties at the gym and I'm sorry I doubted them too. Ballmer looking good in retirement. Um, I can think of one case where no apology is needed. Oops! I gotta run. Burger King is closing soon and I need a couple of Double Whoppers with cheese, onion rings and maybe one or two picks off the dollar menu because I always worry that I might still need a little more. If it it turns out I don’t, which hasn’t happened yet, I’m sure I’ll think of something. Supersize me baby! You know what’s funny? I just remembered that about four hours ago, I ordered the Taco Bell special with 3 Taco Supremes which included a giant Mountain Dew and then I asked for one of those beefy quesadilla things off the dollar menu (yes, in those words) please. Then I went right into my best deer-in-the-headlights blank stare until the young lady prompted me to swipe my card. I came to, did as told and explained to her that I need a lot of guidance and sadly it’s probably going to worse before it gets any better. She had a good laugh at the crazy old guy sporting a brightly colored Beatles Yellow Submarine tie dye shirt and a Boston accent. So, I really do worry about not getting enough I guess. That’s sad but it makes me laugh out loud thinking about it. I’m sure I am not the only one. It gets worse. I had to walk past Burger King on the way home and I actually condsidered maybe just cheeseburger for dessert, you know? Being the health conscious kinda guy I am, even if I did let my gym membership lapse I forget if it was two or three decades ago now, I resisted the temptation and kept on walking off the beefy quesadilla thing. It’s a damned good thing there’s no Dairy Queen around here. I’d be screwed. Took too much time. I guess I will be doing the drive through on foot again. Yeah, I really do that. It beats going without. One of these days they’ll probably put up a sign not allowing pedestrian orders there. What can possibly go wrong is how I see it, aside of the all too frequent order screw up. Is a speeding drive through driver going to run me over at 5 mph? Maybe an electric car could sneak up on me from behind, driven by someone texting but what are the odds? For two Whoppers after 11 PM, I’ll take my chances. I let my gym membership lapse a couple years ago. I blew out both shoulder cuffs on a pectoral fly machine, made me an invalid for 6 weeks, crippled for 3 months, took 6 months before I could move somewhat normally where most of the muscle spasms and stiffness was gone. There was no way I was going to go back and do that to my legs or hips, so now I'm a civilian. Don’t worry. You forget about your own built in all natural cat powers that do not depend on anything. You just have them. Yesterday I witnessed my little kitten playing with my older one, jump vertically from a standing position to approximately two feet, maybe more, instantly. When she landed she hit the ground running in nearly the opposite direction she’d lept straight up from. I am not making this up. She is amazing. She is also a little instigator who loves sneaking up on and attacking her best friend who is twice her size and then some not to mention yours truly. A gym is for people, mere mortals who need all the help they can get. Cats have super powers! You posted this after I asked you to prove you are human. Bots don't follow their own posts and neither do you. I pronounce you bot. You know how to prove me wrong. Email me and I'll lift the ban. 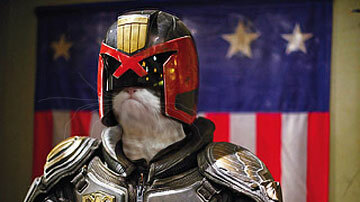 Kitties hold everyone in contempt, don't they? 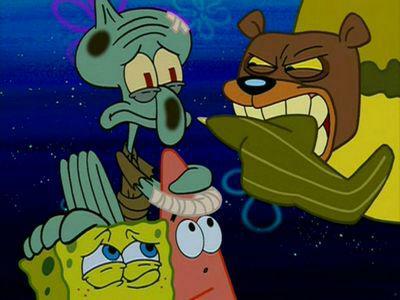 We're not as bad as Sea Bears.